The title of Roy Anthony Shabla’s rogue public art work “We Are Now” turns out to be prophetic. It was a work destined to be experienced only by the immediate present, as now it has been painted over, presumably by the city. 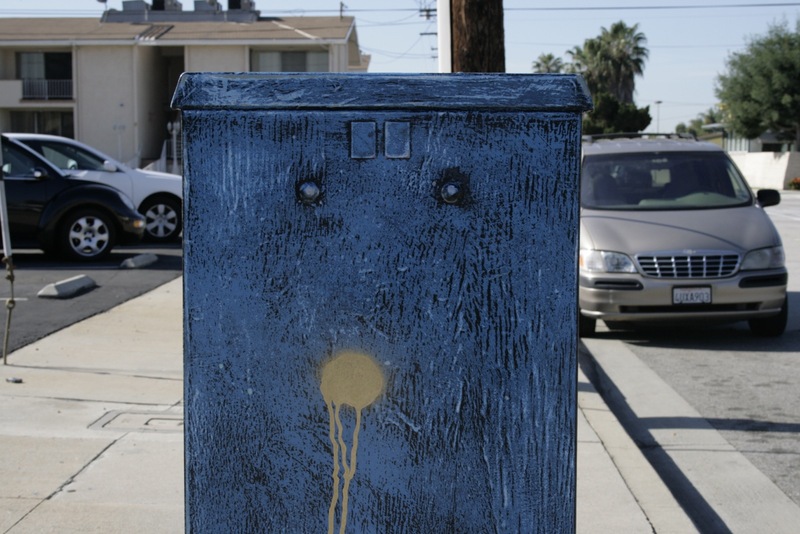 Shabla was part of a group of local artists who were putting together a presentation of utility box concepts, organized by the Downey Arts Coalition. Other artists turned in sketches and brief statement, but Shabla decided to turn in a finished product. Downey advocates and artists tried to take the call seriously, slowly gathering concepts from artists, and starting conversations with the city about ways a process could be put in place to make this happen. Efforts have been drawn-out, due to the lack of an infrastructure for the arts to support something like this. The Downey Art Vibe and the Downey Arts Coalition are both grass-roots efforts led by volunteers who try to accomplish things in their spare time. Downey does not have a city arts commission, and last year dissolved its “Art in Public Places” committee. Over the course of the last week, Shabla publicly painted an intricate work of art out of a telephone utility box, but without the permission of the city as part of a sanctioned program, which was the plan. 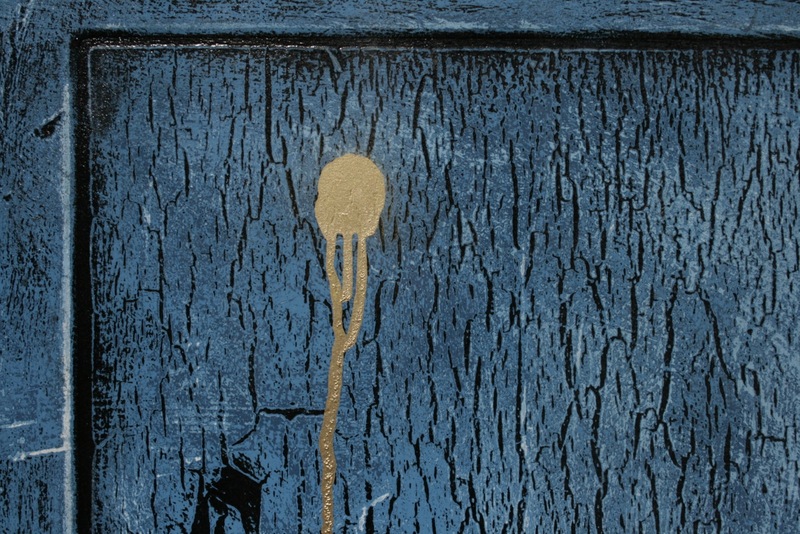 It had the look of a weathered old cabinet, with sprays of gold paint dripping down, evocative of what is normally known as street art or tagging. 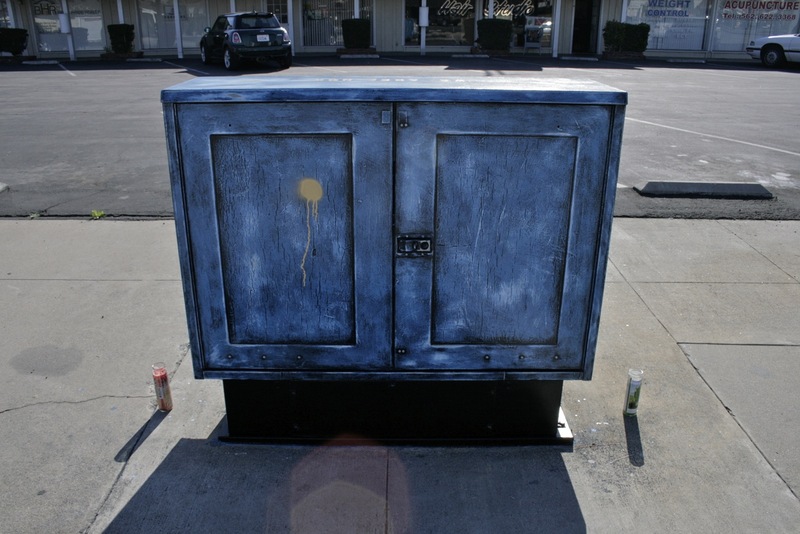 On Wednesday, Shabla emailed local news outlets the Downey Patriot and the Downey Beat with pictures and an extensive artists statement and provided an “official” interview about the work of art. The Patriot posted it immediately on their website. To read the full interview, click here. Immediately, city officials and councilman Mario Guerra responded saying that the project was not sanctioned and is illegal. The staff threatened to paint over it. Arts advocates, including the Downey Arts Coalition issued apologies to Guerra, hoping the artwork could be preserved. Local business owners in the strip mall nearby also said they would call to complain. The box was painted over on Friday. 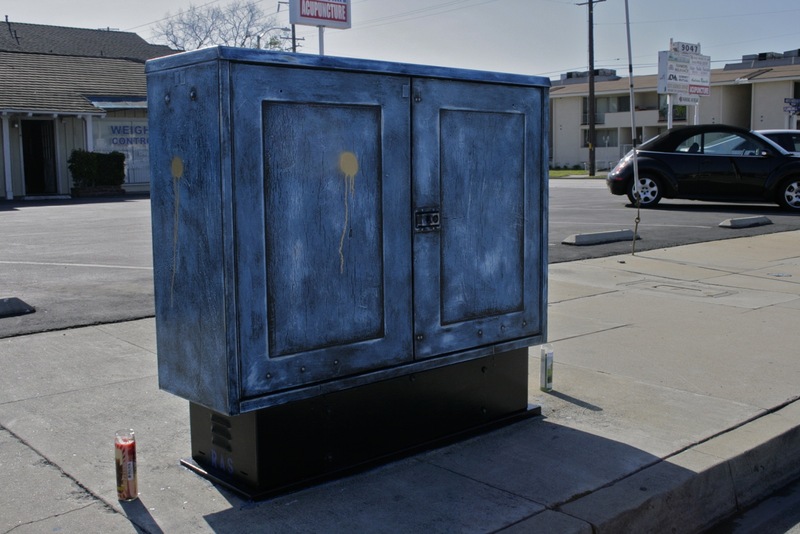 The Downey Arts Coalition, in addition to the Downey Art Vibe are continuing to pursue legitimate channels with the city’s Art in Public Places program to sponsor local artists to paint local utility boxes. 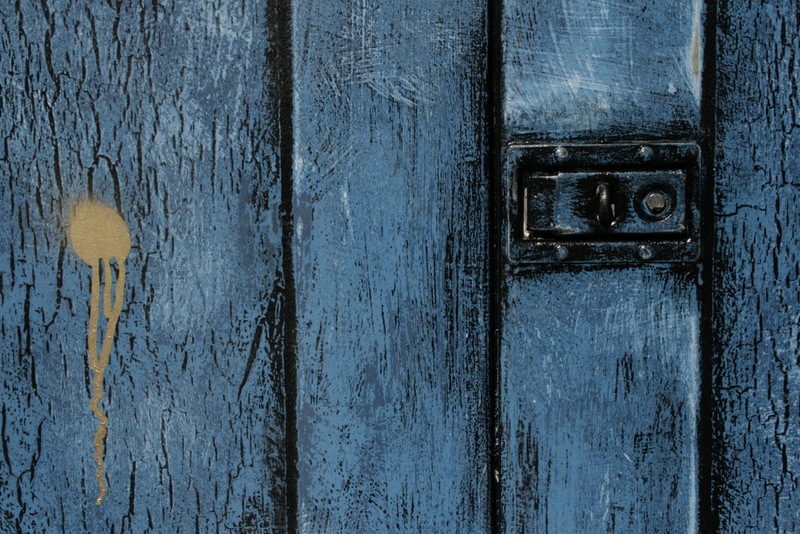 Like other creative entrepreneurs in the community, this is the reason I left. This is typical Downey politics and the reason why it has lost unique individuals who could both, make a change in the art culture that is lacking in Downey and two, improve business revenue for other small businesses in the Downtown area. The city will never understand the fact that Art is the marketing tool that this community needs to bring tourism from local markets and improve it’s economy, but more importantly, its visibility with consumers that are looking for a shared experience somewhere else. The most recent major event listed was the filming of the movie “Pineapple Express” along Florence Ave in 2008. Surely Downey can be much more than it currently appears to be in the Wikipedia. 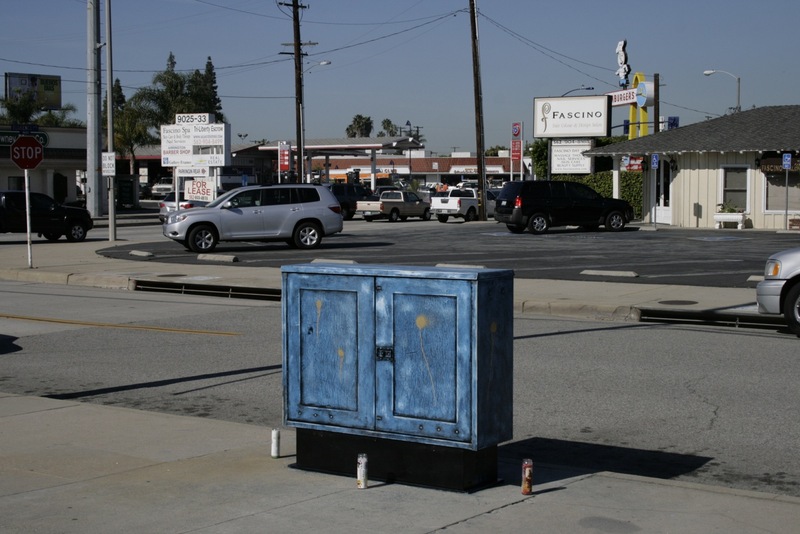 Roy Shabla transformed a grey box at the corner of Florence & Arrington into a “We Are Now” artwork to show how art can “DIGNIFY DOWNEY” It saddens me that Downey city officials responded by painting over the artwork. What a lovely idea to beautify the city. What a shame that the city decided to immediately paint over it. Surely there must have been other alternatives? How tragic that this wonderful piece of art is lost except for the pictures. Way to go, Mr. Shabla! I’m so sorry to hear your art was painted over. 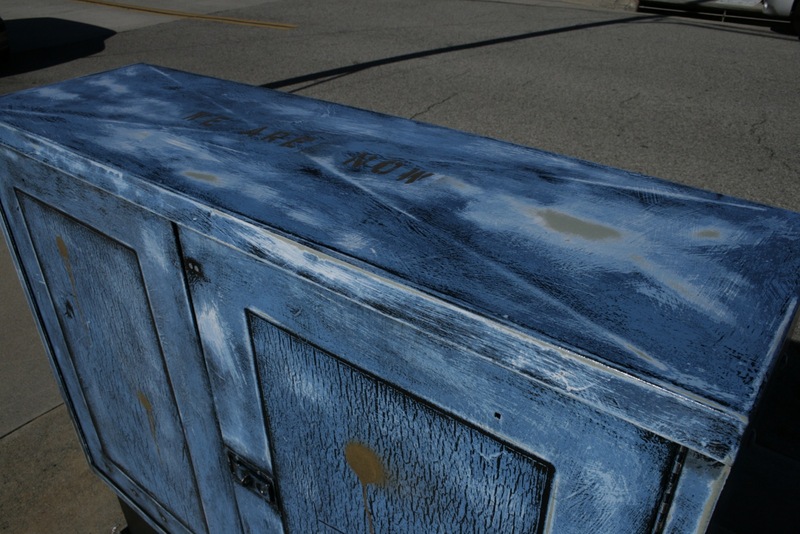 That electrical box came out beautiful…I cant beleive they painted over it. It looks even uglier than it did before. This city needs to change or else everything in this city is going to be dull and bland like that electrical box. Dissent is not disloyalty. the fate of Mr. Shabla’s piece is in the spirit of most street art. The beauty is transient and all the more valuable. Ironically, the controversy over Roy Shabla’s artwork has probably been more successful in bringing art to the forefront of people’s minds than if the City of Downey had just left his piece untouched. And… in their backward effort to censor him, they couldn’t have been more helpful in promoting Roy as an artist! Roy Shabla’s work should be celebrated. Art can exist as part of the public realm as a way to make each moment of our lives more meaningful and beautiful. It does not need to be conscripted to museums in other cities for other people. Mr. Shabla should be paid, not painted over. I also am a great fan & friend of Mr. Shabla & totally agree w/ Morgana. Art by its’ very nature, provokes & incites discussion. I have no doubt Mr. Shabla will continue his artistic endeavors & by that effort, maintain the discussion and community enlightenment. Well, looks like we owe Roy Shabla for taking the time to give us a wake-up call. Talking about art is a precept to having art and he has sure taken things a step further. We could thank him and ask for some of his other ideas, select one and get on with the project. Glad we have an artists willing to get involved! This can make us think and realize there are many different realities coexisting in Downey! Yeah. 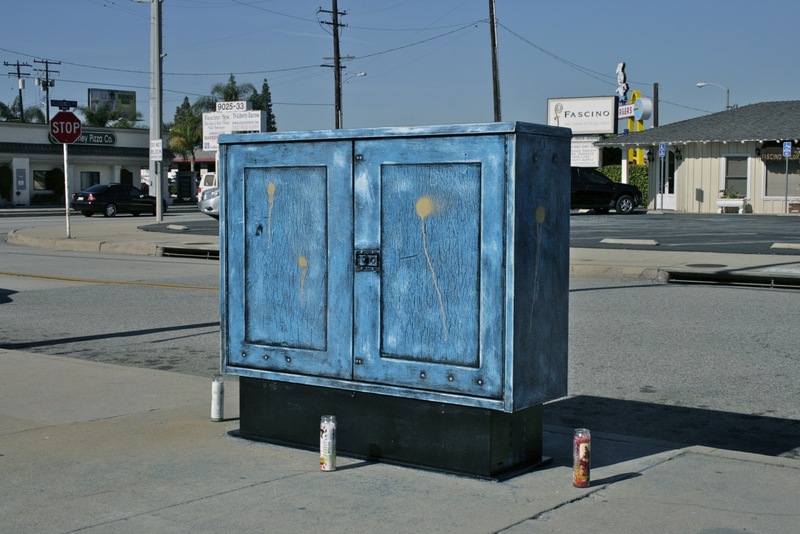 Now that Roy’s got people on both sides talking about the role of public art, grant him official permission to repaint the utility box and let a thousand flowers bloom in Downey. I own the barber shop Number 34 across the street from the electrical box, and I loved looking out to see Roy and his team transforming the ugly electrical box. I would take my clients and show them his work. It was a sad to see that the city didn’t share the same vision that Roy did. Bring back “We are now”. I am saddened to hear of these events. As an artist who tries to circumvent channels as much as possible I know how it feels to have your art removed from public view. I would hope that Downey would value art more than process in the future!!! Way to go Roy. Keep up the good work and don’t let narrow minds prevail. I caution everyone that removing art from public view is not solely a Downey problem. This can happen anywhere and does as long as the public remains silent and cities unresponsive. Art is life and hope and everything that make cities their best!! !